If a political party wins enough of the vote then they might just gain sufficient influence to adjust electoral boundaries and increase their chances of winning again. Gerrymandering is one example of stacking the odds in your favour. It’s a big deal in the USA at the moment (e.g. see Washington Post article). Any competitor would like to manoeuvre themselves into a position of advantage. It’s a common game, with hazy rules. The early surrealist and exponent of play, Roger Caillois asserts four ideal game types (and their corruption): those that play on competition, chance, simulation and vertigo. Games of chance are found in activities that rely on the roll of the dice and gambling. Speculation on the stock market is an obvious example. Games of simulation are concerned with mimicry, theatre and the carnival. Ceremonial etiquette and the wearing of uniforms are formal examples. Vertigo concerns the thrill of speed, mountain climbing and fairground rides, which in turn find institutional expression in various dangerous occupations, like fire fighting and sea rescue. Our tendency towards competition can lead to violence, power mongering and trickery. Chance can lead to superstition and speculations on astrology (according to him). Simulation can produce alienation and split personality syndromes. Tests of endurance under extremes of space and time (vertigo) can give way to the thrill of “chemical excess,” that is, alcoholism and drug addiction. But if we take into account the nature of the meta-game (see previous post) then we see that games can be played in this space between the institutional and the deviant. Sport is not only playing with a ball or against a team, but playing with advantage (and handicaps), assembling the best team, and taking risks with the prospect of injury, both on and off the field. Some nefarious meta-gamers try to win another game — with bookmakers — by bribing or blackmailing players to lose! It’s complicated. The world of economics involves a play between healthy competition and cunning coercion of one’s customers and denigrating the competition. In the moral domain, where one draws the line is always contested. The line is — in play. The character of the game is well represented in Caillois’ attempt to rescue the game from inauthenticity, which appears on a chart, a five by four game board, with the column of authentic game categories on the left and their supposed corruption on the right. We gamers are apparently drawn by our base instincts from the left to the right, only to be persuaded by Caillois’ reflections to consider the quest for the authentic game, the restored game. Caillois suggests a balance along the axis of institutions. It transpires that the authentic game is more a quest than an actuality. A game skeptic could say that sports are already corrupted by the impetus for violence, lotteries are a form of superstition harking back to ancient augury, schizophrenia is the basis of carnival, and extreme sports are a means of overdosing on endorphins and adrenaline. 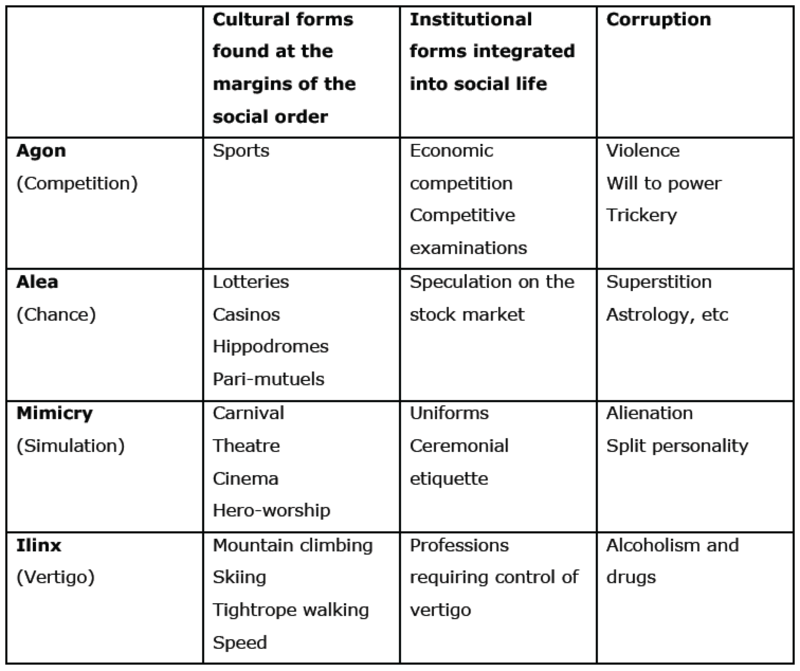 This is not to exclude a certain preference for one side or the other of the game table, nor to exclude one extreme as more socially favourable than the other, but to show that the categories are in play, and to suggest that the playing of the game (football, roulette, dressing up, car racing, Fortnite) already depends on, and derives from, a larger arena of meta-play. Torturing the game taxonomy further exposes the quest for the ideal game. Games already lend themselves to the mysterious, irrespective of the “narrative content” of the game. They have uncertain outcomes, which games of chance make explicit. Games also have rules and instructions, which, to the uninitiated, appear mysterious. The skills of the player who wins more often than loses also constitute a mystery. Furthermore, like those other great metonyms, the machine and the book, the game readily serves as a metaphor for the world, the rules of which we are trying to discover. Images: The Ferris wheel is in the never-used and derelict fair ground at Pripyat in Chernobyl, Ukraine. The bungee jumper is at Scheveningen, The Netherlands. The skateboarders are by the river, Bratislava.